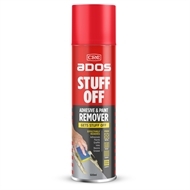 A powerful remover that is designed to soften or dissolve most adhesives and paints as well as uncured laminating resins and uncured sealants. The gel formula clings to the surface making it also ideal for vertical applications. It also removes paint spills, graffiti, inks and grease.